Minnesota born Federal ammunition has become a popular choice of hunters the world over, for their highly effective and reliable ammunition. 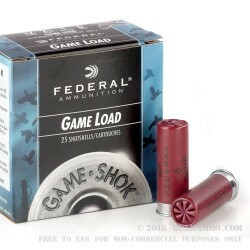 Since 1922, Federal has created specialized high-performance ammunition for a wide variety of shooters, whether it be target practice, self-defense or your next duck hunt, Federal has a load for the job. 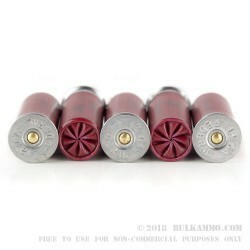 These 12-gauge, Game-Shok rounds have 1 oz of #6 lead shot and are loaded into a 2 ¾” shotgun shell. These shells feature a brass plated steelhead and a one-piece wad design which allows for tighter patterns and maximal damage. Using the finest powders and noncorrosive primers, these shells deliver a reliable consistent shotshell, perfect for your next upland hunt. 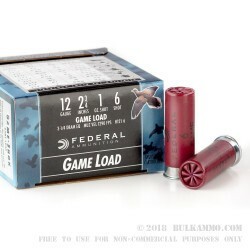 This bulk package comes with ten, 25 round boxes of Federal 12-gauge 2 ¾” Game-Shok shotgun shells.